The coin pictures an eagle (vulture) shaped golden plaque belonging to the Germanic strain of the Gepids. In fact, it is a piece of harness made of gold and embellished with garnets (red gems). 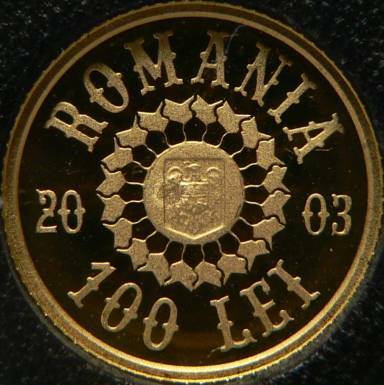 It was found in 1968 in a hoard at Apahida (the Romanian county of Cluj). The representation of the eagle is not at all singular. 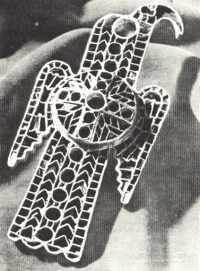 See below an Ostrogoth artifact picture (at right) taken from an Italian history book. 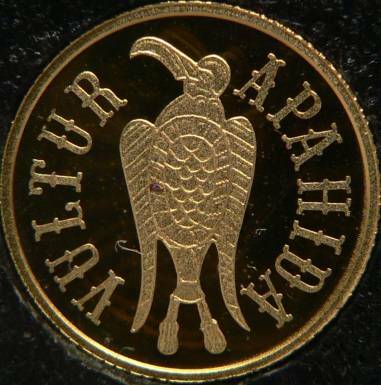 The Apahidan eagle coin was engraved by Vasile Gabor. Up to 2.000 pieces were struck, not more - cannot tell the exact number. It was sold in a plastic capsule. Sold for 1.350.000 lei (about 38 €). But if you really want to have it, you are to buy another wooden box that will hold it, worth another 150.000 lei. The plastic capsule is well fit inside the box, but the coin itself IS NOT inside a rubber ring that, itself, isn't well suited with the plastic receptacle I told above. So the coin goes like free hither and thither despite a vaunted wrapping and a high price.